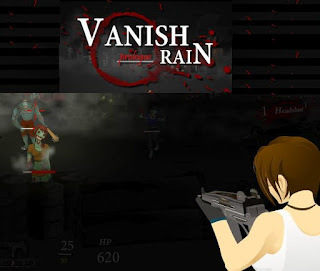 Vanish Rain is a new zombie blasting action shooter game from origaming. In Vanish Rain prologue the story revolves around Anna, one of the little survivors of the Vanish Rain incident. She is somehow immune to the virus, yes the one that will turn a person into walking dead that eats human flesh, and she manged to survive. However, the only reason for her to live is to find her lost brother. Maybe he's already dead but she decided to wait for him to show up at the place where they last parted and survive for the next 15 days before the impending bombardment. Main features of this game are 15 different weapons, 15 different zombies and a big boss, challenge levels where you can test your skills and the survival mode where you have to last up to 30 days. Anyways, I played this one and got to beat the game in one sitting with only 4 weapon types and I must say that it is a good one. One tip is that you max out first your first gun then the second smg. The shotgun, I think, have their attributes a little off balanced. The reload speed for me is more important than the damage. But that's only for me. Meanwhile, here is Vanish Rain walkthrough other people because I forgot to record my gameplay so forgive me. I see you got really very useful topics ,This site has always been pleasant news Thank you very much for such an interesting post, and I meet them more often then I visited this site, I will be always checking your blog thanks. Such a very useful article. Very interesting to read this article.I would like to thank you for the efforts you had made for writing this awesome article.